Here's a 100W output 28V power amplifier, based on a Motorola MRF174 FET. 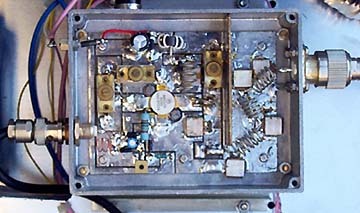 This amplifier gives 100W output for about 5W input, and is about 70% efficient. To the right of the internal screen is the harmonic low pass filter. This is made of 18SWG tinned copper wire and metal clad mica capacitors (Unelco or Semco) to keep the losses down.